Takanuva is a character in the BIONICLE storyline. He has been released several times, 2003, 2008 and 2010, including once under the Matoran name "Takua." For ages in the BIONICLE world, there has been a prophecy: that in a time of great darkness a Toa unlike any other would appear to challenge it, one with the power of Light and a Kanohi Mask of Light. This Toa would have a Herald come before him, and was also known as a "Seventh Toa" (the significance of this number is unclear; the standard Toa team size is six but there have been larger groups). However, the Brotherhood of Makuta, who helped guard the Matoran people, declared this a false myth. But the Brotherhood was secretly corrupt, and they believed and feared that a Toa of Light would oppose their activities. They stole the Mask of Light from its makers and hid it so that this Toa would never arise. In time, they caused the prophesied darkness when one member attacked the universe's protector, the Great Spirit Mata Nui, leaving the universe unguarded. Even more, this member triggered an endless war with a rival group. And the Toa could do little to contain the chaos, with their numbers being a fraction of what they once were. One thousand years after the attack on the Great Spirit and the ruin of Metru Nui, Takua, who was considered by everyone to be a rather irresponsible Ta-Matoran, discovered the Mask of Light inside a forbidden lava cave. The Turaga elders, reading the prophesy inscribed on the inside of the mask, proclaimed that the coming of the Toa of Light was at hand and that his Herald must undertake a journey to find him. Having noticed the mask shine brightly on Takua's friend Jaller, they recognized him as the Herald; and Takua was fully in favor of this as he didn't want the responsibility. But Jaller retaliated and had Takua appointed his traveling companion, and they and Takua's pet crab Pewku (their steed), set out to find this Toa by following the mask, which glowed more brightly when facing in the direction they were supposed to go. Unfortunately, their journey was not easy; the Makuta that attacked the Great Spirit had followed them to Mata Nui and harassed them almost since they first arrived. Desperate to stop the Toa of Light from being found, he released six of his "sons": Rahkshi, who would destroy everything in their path to the mask and its Herald. He also threatened Takua directly, warning him that Jaller would die if the mask was not turned over to him. Takua refused, but he was so shaken by the encounter that he abandoned the search. But when the Rahkshi tracked him down - even though he didn't have the mask with him - he was forced to admit the truth that he was the destined Herald instead of Jaller. The two reunited and continued their search, bringing them to the island's Kini-Nui Temple. There, the Rahkshi attacked them as one, but they were saved by the island's protectors, the Toa Nuva. The Toa Nuva fought bravely and defeated five of the six, but the last Rahkshi broke through and was about to kill Takua. In a last-ditch effort, Jaller threw himself in the path of the attack, sacrificing himself so his friend could live. At this, Takua realized that he was not meant to be only the Toa of Light's Herald. He put on the Mask of Light himself, transforming into the legendary Toa and renaming himself "Takanuva" (revealing to everyone - including himself - that he had been, in fact, an Av-Matoran and not a Ta-Matoran). He then destroyed all six of the Rahkshi for good, though it was too late for his friend. The next day, Takanuva and the Toa Nuva built an Ussanui hovercraft from pieces of Rahkshi armour and took off on the vehicle to confront Makuta alone - though upon arriving he found that his friend Hahli had stowed away. While Takanuva sent Hahli to bring the island's Matoran to the lair, Makuta challenged him to a mock kolhii match that ended up shattering most of the lair's pillars; and when the Matoran arrived, Makuta took out the last one, causing a cave-in that trapped everyone in the lair. Takanuva then tried to tear the Mask of Shadows off Makuta's face, but both ended up falling into the lair's pool of energized protodermis. They emerged fused into one being, called Takutanuva, with Takanuva's personality in control. Takutanuva went over to a giant stone gate and lifted it, reopening the path to Metru Nui and allowing the Matoran to escape. When Hahli passed carrying Jaller's mask, Takutanuva stopped her and gave some of Makuta's life force to resurrect Jaller; but this caused too much of a strain on Takutanuva and he was crushed by the heavy gate. However, the Mask of Light survived the impact, and Takanuva's body was restored in a beam of light. Since then, Takanuva has been adjusting to his new role and responsibilities as a Toa, and is still unsure of himself when with the more experienced Toa Nuva. When Turaga Dume sent the Toa Nuva off to retrieve the Mask of Life, he insisted that Takanuva stay behind to protect Metru Nui. Jaller later gathered a group of Matoran to follow and aid the Toa Nuva, and Takanuva was a part of this group until they came to a gate that no light (or Toa of Light) could pass through, forcing him to turn back. With the Toa Nuva departed for Voya Nui, Takanuva is unknowingly being targeted by a Dark Hunter codenamed "Dweller", who has been stationed in Metru Nui for over a thousand years to wait for the moment when Takanuva is at his most vulnerable. He has also had to deal with a number of Frostelus attacks. Takanuva will later join the Toa Nuva in the battle for his long forgotten homeland of Karda Nui, where he will be receiving a powerful new form. Takanuva is the only known Toa of Light to exist, so many of his powers are unique to him. He can manipulate and control light, making it possible to shoot a powerful, bright beam of light energy at enemies that can stun or destroy them (like a laser beam), or create a sphere of light energy that he can throw at his opponents and cause serious damage. He wields the Staff of Light, and his Avohkii Mask of Light can bring understanding and peace to others. Besides these powers that he has already demonstrated, Takanuva is capable of more. He has been experimenting with such abilities as light-speed movement and the projection of holographic illusions, but has not yet been able to pull them off. He also has the Av-Matoran ability to change what colour his armour appears to be, but is not aware of this ability. 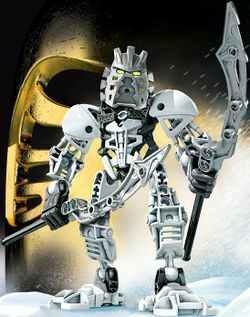 It is a common misconception that Takanuva is a member of the Toa Nuva, due to the similarity in his name and style of armour and to LEGO promoting him as a "seventh Toa". He is in truth not an official part of the team; he does not have the enhanced Nuva powers and does not share the Toa Nuva's destiny of waking Mata Nui, and canon always describes Takanuva as just a "Toa", never a "Toa Nuva". The prophecy of the "seventh Toa" had an effect on the construction of the Toa Canisters. According to one of the builders, they specifically avoided building more than six canisters in each set in an attempt to keep the time of darkness from coming: they reasoned that if a seventh canister was built then a seventh Toa would use it, and the seventh Toa would only come in a time of darkness. So, by their logic, if there was no canister then there would be no Toa to use it and no darkness for him to challenge. 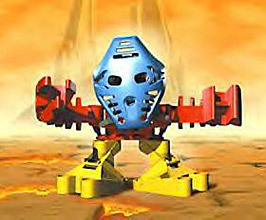 Takunuva has been misnamed as Takua Nuva in the BIONICLE: The Game. This is a description taken from LEGO.com/BIONICLE archives. Please do not modify it. The Toa of Light wears the Kanohi Avohkii, which can project powerful beams of light energy and banish the shadows. The Avohkii brings understanding, turning anger to peace and enemies into allies. His destiny is to challenge Makuta, master of shadows, and lead the Matoran out of the darkness and into the light. Takanuva carries the Kolhii Staff of Light, and rides the Ussanui, a sleek vehicle made from parts of Rahkshi and Bohrok-Kal. The Ussanui is powered by kraata and can find its way to Makuta wherever he may be. Since barely escaping the attack of a shadow leech, Takanuva has been torn between light and darkness. Despite this, he is determined to somehow save his friends from the Makuta and fulfill his destiny. Takanuva was once Takua, a Matoran of Light in Karda Nui, before going undercover on the island of Mata Nui. He was the first Chronicler, following around various Toa and recording their adventures. He managed to get into quite a few of his own adventures, until he found a special kanohi mask: the Mask of Light. While he and his friend Jaller, captain of the Ta-Koro guard and later a mighty Toa, searched for the rightful wearer of the Mask of Light, they battled Rahkshi and other menaces. Eventually, Takua realized he was the rightful wearer of the mask, so he put it on and became Takanuva, Toa of Light. Ever since, he has been helping the other Toa protect the Matoran workers, and fighting back against evil Makuta. Now, on the surface of Bara Magna, Takanuva helps Tahu and Gresh recover the scattered pieces of the golden armor. Will the awesome Toa of Light meet his match at last, or will he lead the Toa to victory on Bara Magna? General information comes from the BIONICLE: Mask of Light movie; see List of BIONICLE media.